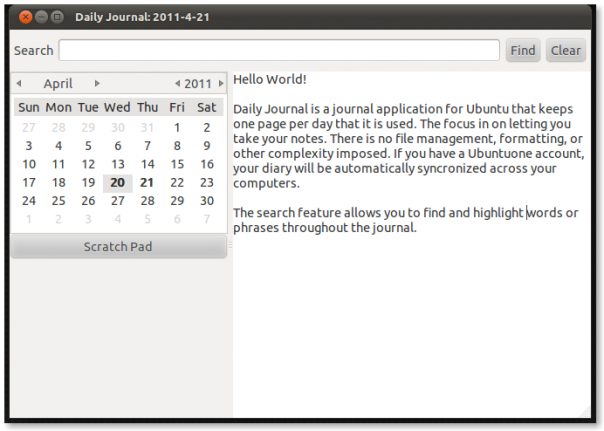 Daily Journal is a journal application for Ubuntu that keeps one page per day. The focus is on letting you take your notes. There is no file management, formatting, or other complexity imposed. If you have a Ubuntuone account, your diary will be automatically synchronized across your computers. The big change for the 10.04.1 release was that we switched the note navigation from a simple list of dates to a calendar that can be navigated. Depends: python-quickly.widgets but it is not installable (M: installing quickly-widgets possible but does not remove error message). Martin: I ran into the same thing. I was able to get it somewhat working by installing quickly-widgets so I was lucky. I had much better luck with Red Notebook which seems to be a more robust app. I was able to have it up and running it a couple of minutes, have played with it for a while and it seems to do all that Daily-journal does and more. If you are on maverick just change lucid above and all else is the same. on the sourceforge page it gives the code for Maverick. So I made the adjustment as above and all worked well. I get the following error message after ‘sudo apt-get update’. Just add ppa:rick-rickspencer3/ppa to Software Sources ‘other sources’ tab.